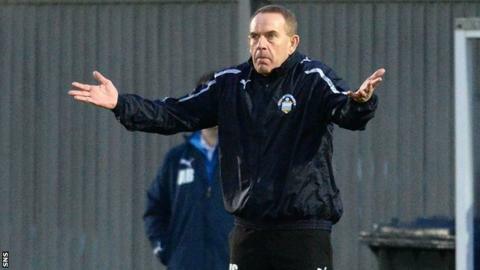 Kenny Shiels has resigned as manager of Greenock Morton in the wake of their 10-2 defeat at the hands of Hamilton. The Northern Irishman, 58, became boss at Cappielow in December 2013 after being sacked by Kilmarnock following two years in charge at Rugby Park. "I'm extremely disappointed that things didn't work out at Greenock Morton," Shiels told the club website. "I'd like to take this opportunity to wish everyone associated with the club all the very best for the future." Morton were relegated from the Scottish Championship this season. And they were criticised for Saturday's heavy defeat against Hamilton. The margin of Accies' victory meant they would have won the title had champions Dundee drawn against Dumbarton. Morton chairman Douglas Rae said: "I can confirm that the board have accepted Kenny's resignation, and we wish him every success for the future."